Barnet Braverman was a socialist magazine editor and advertisement scripter. Braverman helped smuggle copies of James Joyce’s Ulysses across the border from Windsor, Ontario to Detroit, Michigan, during a time when the novel was banned in the United States. It is estimated that Braverman’s was born in New York around 1895. He worked for a variety of socialist and left-wing publications. In the early 1910s, he worked in Chicago for The Progressive Woman, writing articles that condemned the subjugation of women and argued for the rights of suffragists. During this time he met and befriended the American author Ernest Hemingway. By 1922, Braverman was working as an ad man for the Curtis Company, and traveling back and forth between the company’s offices in Windsor, Ontario and Detroit, Michigan. During this time Braverman was contacted by Sylvia Beach, the owner of Shakespeare and Co., a successful English-language book store in Paris, France and publisher of James Joyce’s novel Ulysses. Beach was trying to get copies to customers in the United States, where the book was banned on charges of obscenity. Hemingway recommended Braverman to Beach, who contacted him with a proposal to smuggle copies of the banned book in the U.S. Since the book was not yet banned in Canada, Beach would ship copies to Braverman, where he would store them in a room he rented in Windsor. 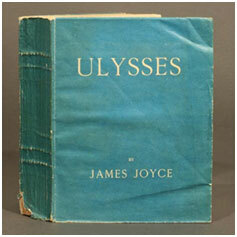 As he crossed the border by ferry on a daily basis, he would carry a copy or two of Ulysses through customs, which he would then ship to other destinations in the U.S. A year later Ulysses was banned in Canada, and remained so until 1949. Birmingham, Kevin. The most dangerous book: The battle for James Boyce’s Ulysses. Penguin Press. 2014.